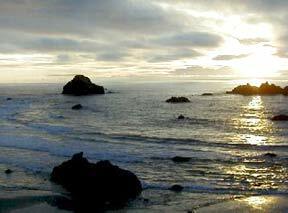 Bandon was rebuilt after a devastating 1936 fire destroyed the entire business district and most of the residences. A brick chimney on the site of the old bakery stands as a memorial just off Hwy 101. Today the Old Town district is a center for art galleries, shops, and great dining places. More great dining is along Beach Loop Drive. The chamber office and visitor information center are at the entrance to Old Town in the little red building. Bandon is known as the Cranberry Capital of Oregon, and the annual Cranberry Festival in September brings many people to town. The Sprague Theatre is the venue for live theater productions.